Tada! I got not one, not two, but three bags (four actually, if we include the small shoulder bag). 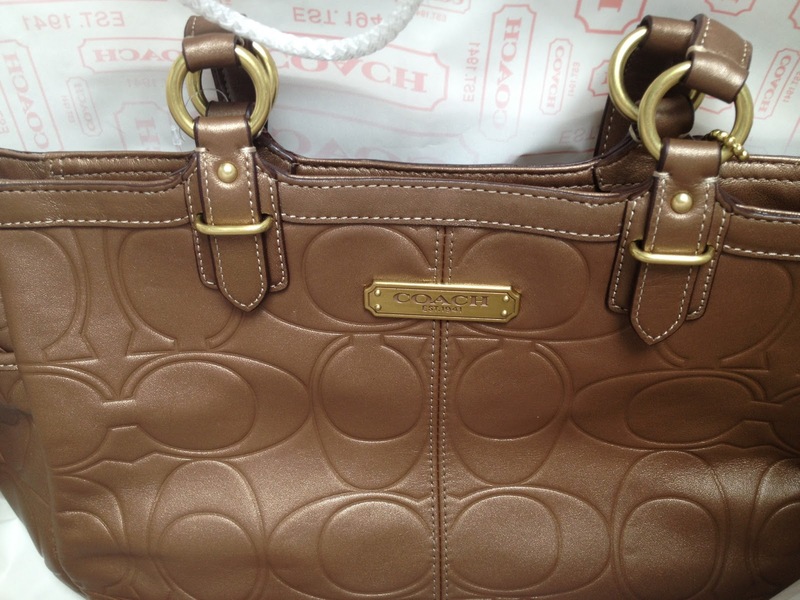 The Coach Legacy Tote. This bag comes in very delicious colors such as red, orange, bright blue, and yellow. I have been eyeing this since I first saw it in HK a couple of months back, but I’m glad I held back coz I was going to get the red version then, but lo and behold, they have it in yellow as well! See, great things come to those who wait. 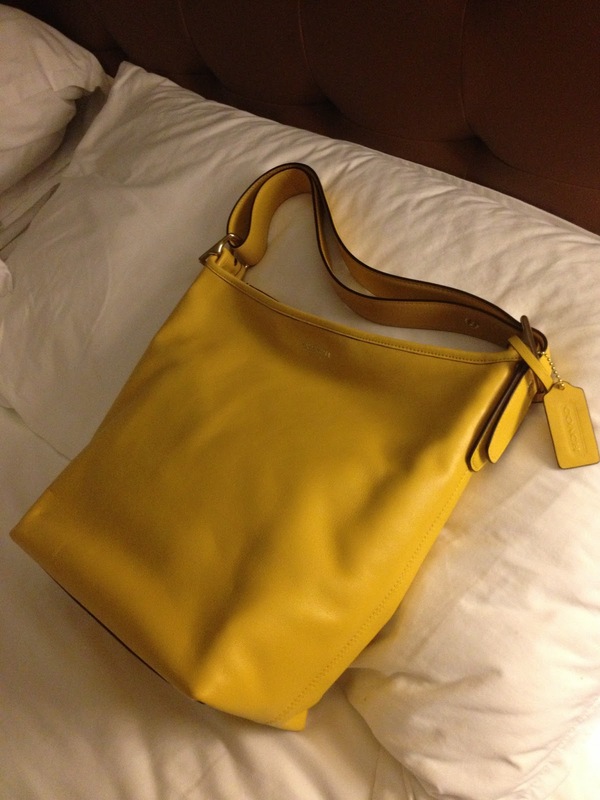 What I love about this bag is first, it’s not very expensive. I tend to really take my time when buying branded stuff, because, well, money doesn’t grow on trees and I don’t really see the need to get all designer all of a sudden (and yes, I’m still kuripot at heart). Also, since it’s in a very light color it would mean it will get dirty pretty soon and I might need to replace it, so all the better if replacing it won’t cost me an arm and a leg. And yet, it’s made of leather and is very light. I don’t like structured bags (as you can tell from this bag post) – I prefer them slouchy and big so this was perfect for me. This bag packs a lot! I was able to fit my Olympus micro 4/3 camera, my bulging kikay kit, my wallet, Joey’s change of clothes, plus two cellphones, and it still looked roomy enough for more. Up next, is a shiny, leather logo bag also from Coach. 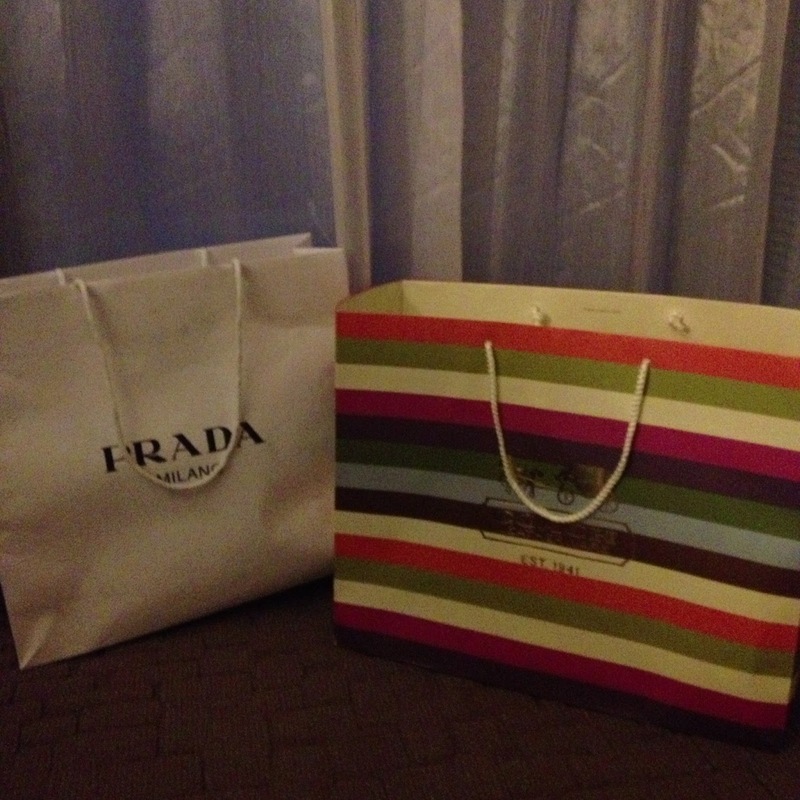 Now, thank goodness for outlet stores! I got this bag at a third of its original cost! I’m not into logos really, and gravitate towards designer stuff that have discreet logos but this one is in a lovely shade of chocolatey brown and gold hardware which I knew my mom would love (this bag eventually ended in her Christmas stocking) and it’s riddled with lots of C’s, my initial, so I had to get it. 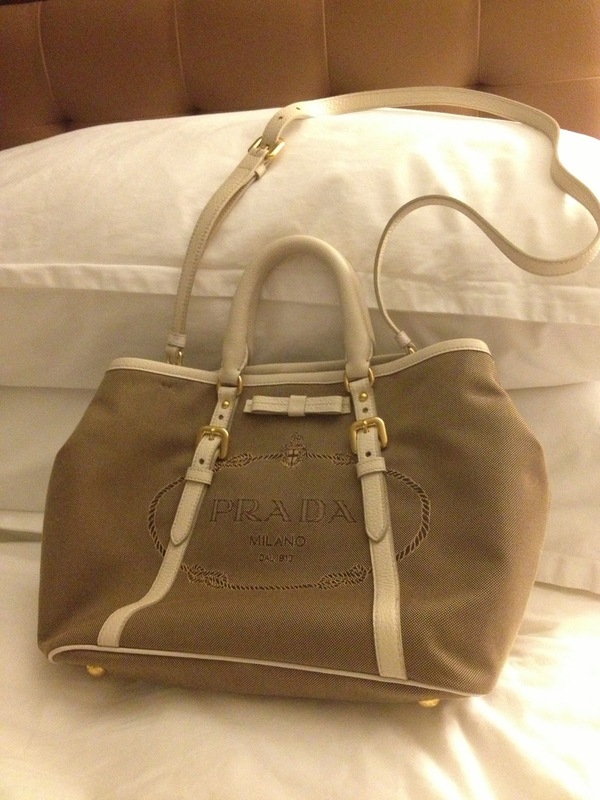 My third purchase is this beautiful jacquard bauletto bag from Prada. It has two short handles and a detachable strap should you want to use it as a shoulder bag and trimmed with gold hardware. I just love it! It’s also quite roomy like my yellow Coach bag (even roomier, if you ask me) and I have been using/abusing it on an almost daily basis. It does have a Prada label in front, which I would remove if it were up to me, but at least it doesn’t scream too loudly.